Feeling achy? Stuffy? Sore throat? This patented Honey Lemon Ginger Tea will help. No joke. Well, joke about the patent, but no joke about it helping you feel tons better if you have a cold or the flu. 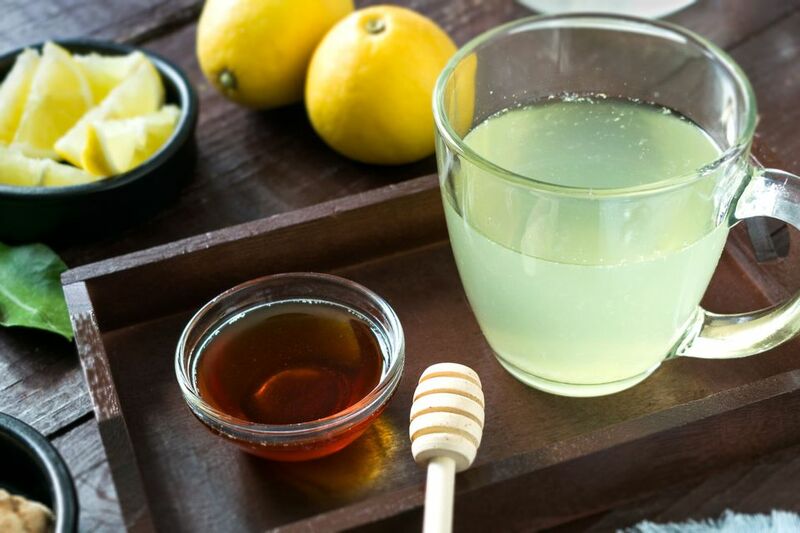 The heat and the ginger will warm you right up, the steam—aided by the bright lemon and the potent ginger—will help clear those sinuses, and the ginger and the honey will work to sooth that scratchy throat. If you're feeling old-school, go ahead and add a shot of whiskey to the mix (especially if you're drinking it right before going to bed) for a sort of medicinal hot toddy. If you're really suffering, try making a triple batch and keep it in a thermos to sip, or reheat it as needed. Want a thoughtful-person-of-the-year award? Make a batch for someone in your house who's suffering. Grate the ginger into a teapot, medium bowl or large measuring cup. In most culinary uses, you want to peel ginger, but there really is no reason to do so here, and it will just take time and effort better spent lying down and resting when you're not well. But you do need to grate it (if you're in a really bad way, you can just slice it, but know you won't get nearly as much of a ginger kick that way and you may regret your laziness). Best case scenario: Grate the ginger on a microplane zester. Next best situation: Grate the ginger on the fine holes of a four-sided grater (or similar). What also works: mince the ginger with a sharp knife. Truly fresh, young ginger will be quite tender, with few fibers getting in your way. Older ginger, however, will have a fair amount of fiber running through it. Go ahead and put it all on the pot—you're going to strain it out anyway. Pour 1 cup boiling water over the ginger and let it steep for 3 minutes. Meanwhile, put the lemon juice and the honey in a large mug. Stir to dissolve the honey, taste, and add more honey or lemon juice if you like. Add a dash of cinnamon, nutmeg or cardamom at the end for a warm spice flavor. Warm spices add more than flavor, they add a sense of comfort and some magical herbal/homeopathic elements, too. Or, use a cinnamon stick to do the stirring to dissolve the honey (this is a particular hit with kids with stuffy noses!). A bit of turmeric (1/4 teaspoon will do it) feels insanely curative and tastes great, and it turns the tea a brilliant yellow; but know that it also stains anything it touches—consider yourself warned. If you like things spicy, add a dash of cayenne—that spicy note will further help clear out those sinuses. If the lemon flavor is too much for you, balance it out with a splash of orange juice. Is it bedtime? You wouldn't be the first person to add a shot of whiskey, bourbon, Scotch, rye or dark rum to the mug.